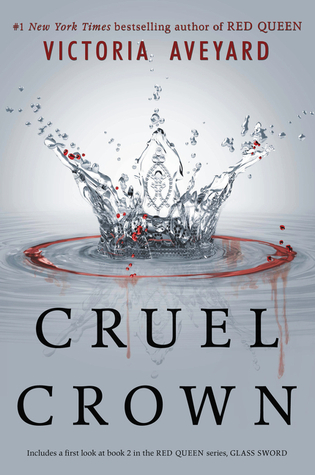 Books 0.1 and 0.2 of the Red Queen series, the two novellas in this book are Queen Song, the story of Queen Coriane, a Silver, and the first wife of King Tiberius, and Steel Scars, which tells of Farley, a Red, and her journey to meet Mare Barrow, the heroine of the Red Queen series. In Queen Song we meet Queen Coriane, as she keeps a diary of her relationship with the crown prince, the birth of her son Cal, and the dramas of a life in the Royal court. In Steel Scars, Diana Farley is a strong fighting woman, scouring the country for people to join in her in the first attempt at an attack on the capital. Along the way she meets Mare Barrow - a girl with lighting who may change the entire operation. Both of these are very short stories - novellas - but they were really neat to read, and get a better understanding of the characters. While Coriane isn't in Red Queen or it's sequel Glass Sword, she is always mentioned. It was really great to be able to jump back in time and see what she went through and really what her story was, even if we only got a little snap shot of that. I did enjoy Coriane's story more than Farley - but that's possibly because all we had heard of Coriane was what other characters had told us, and Farley is one of the main characters by the time we get to Glass Sword, and she's not a character that I really care too much about. Coriane's story, however, was a great insight into a slightly different era in the capital. Also, I think I like Coriane more because she likes books. "There is nothing so terrible as a story untold." 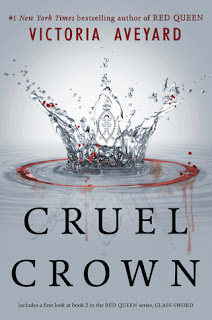 So is Cruel Crown worth a read? If you're enjoying the Red Queen series and want some more insight into the characters, then definitely grab a copy. However, like most novellas, it's not too important to the story as a whole, as is certainly just a fun addition to already great novels. If you do read them, let me know what you think!